ALBUQUERQUE, N.M. — It may sound strange to say that nuclear weapons must survive radiation. But as part of its mission of ensuring the nation’s stockpile is safe, secure and effective as a deterrent, Sandia National Laboratories must make sure crucial parts can function if they’re hit by radiation, especially a type called fast neutrons. Sandia is responsible for non-nuclear components in all U.S. weapons systems and for overall system engineering and integration: pulling thousands of components together into a weapon. It qualifies systems — ensuring their safety and effectiveness — through computer simulations and rigorous testing at unique facilities that mimic radiation environments a weapon could face during deployment or an accident. Sandia developed a new way to do that after its facility for creating fast neutrons, the Sandia Pulsed Reactor (SPR), was shut down due to increased post-9/11 security concerns about its highly enriched uranium. The laboratory created a science-based project called QASPR, Qualification Alternative to Sandia Pulsed Reactor. QASPR combines computer modeling and simulation, experiments and technology development, and draws on expertise throughout the labs, from materials science to transistor fabrication to sophisticated computer science. The idea is to create better radiation-hardened microelectronics for high-voltage transistors, part of a nuclear weapon’s safety electronics, and to offer a way to qualify the electronics without SPR. 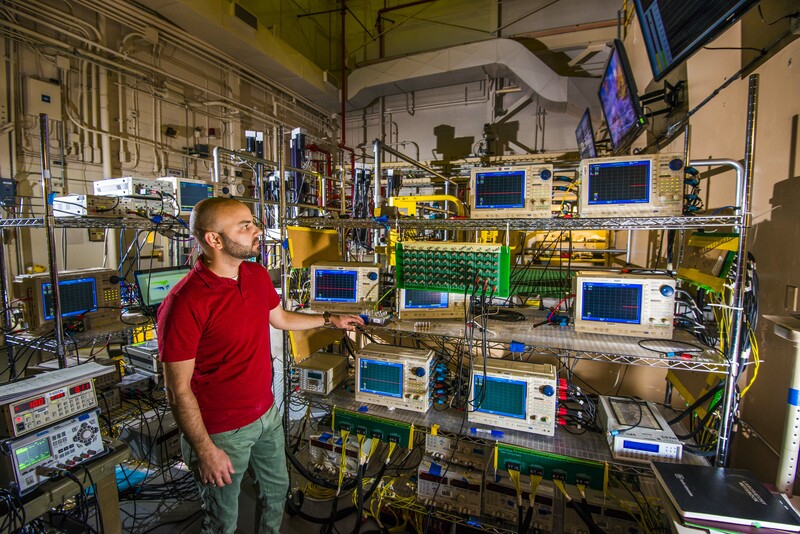 Sandia National Laboratories researcher Billy Martin looks over diagnostics that are part of the Qualification Alternative to Sandia Pulsed Reactor program. QASPR combines computer modeling and simulation, experiments and technology development for stockpile surveillance. (Photo by Randy Montoya) Click on the thumbnail for a high-resolution image. Sandia does more modeling and experimental work than ever before to qualify components to survive the fast neutrons produced by a nuclear burst, either from an enemy weapon or one of our own exploding nearby, said QASPR project manager Len Lorence. Experiments don’t simply validate computer models. They are key to developing models in the first place. QASPR didn’t have the models it needed when it began in 2005. But researchers had time to work on them because the next re-entry system that needed the tools and expertise for qualification was still years away. QASPR focuses on how transistors, which are crucial in some circuits, react to fast neutron radiation and what happens to its gain in less than a second — an eternity in nuclear weapons work. Transistors can provide gain, the amplification of current passing through a device. Neutron damage can cause gain to plummet. Designers can compensate for that, but used SPR to check whether designs operated correctly. QASPR does similar studies at Sandia’s Annular Core Research Reactor (ACRR), its Ion Beam Laboratory and two non-Sandia facilities. Each provides unique tests and complementary data that improve computer models. One of the outside facilities is a fast-burst reactor similar to SPR and the second facility tests response to gamma radiation. ACRR, a long-pulse reactor, creates high levels of damage, although its long pulse makes it less ideal. Still, it provides a calibration point, which simplifies modeling and lets researchers concentrate on phenomena associated with rapid changes in transistor gain. The Ion Beam Laboratory acts as a surrogate for neutron radiation because ions can impart the same kind of neutron displacement damage as neutrons. It combines high damage levels like ACRR with short pulses in one facility. However, it only can irradiate a transistor or a few transistors together, rather than a circuit or component like the larger ACRR can. QASPR also is creating better radiation-hardened microelectronics in Sandia’s Microsystems & Engineering Science Applications fabrication complex. Some of those transistors are based on compound semiconductors, known as III-V for linking elements from the periodic table’s columns III and V. Such compound semiconductor transistors are much more resistant to neutron radiation. Researchers spent QASPR’s early years combining modeling and experiments to understand the basic mechanisms of the silicon commercial-off-the-shelf components then in use and studying III-V devices. This improved technology, along with more robust modeling and experiments, mitigates risk from the loss of SPR. Researchers are interested in the design phase because “we can catch things earlier, we can help guide the design, and ultimately do better qualification,” he said. QASPR’s computer modeling is hierarchal, beginning with studies of materials inside transistors, using fundamental physics modeling and quantum mechanical tools to understand how radiation damage occurs and evolves. Then researchers create a model of how transistor gain changes during and after radiation exposure. Next, models at the analog circuit level aggregate transistors and devices, such as resistors and capacitors, and ever-changing voltages — a complex world where some devices respond to gamma radiation but not neutrons. “The hierarchical approach is very powerful, since it allows traceability from a high-level circuit response all the way down to the most fundamental atomistic material level,” Lorence said. Thus, QASPR offers important information. “At the circuit level we can be very impactful, so much so that we can help the system qualification process, which was our goal,” he said. QASPR and similar efforts to blend experiments and modeling will be needed as long as nuclear weapon electronics continue to evolve, Lorence said. “It’s hard to put into the stockpile the exact same thing that was originally put in the stockpile. At some point it’s not possible, not cost-effective,” he said.